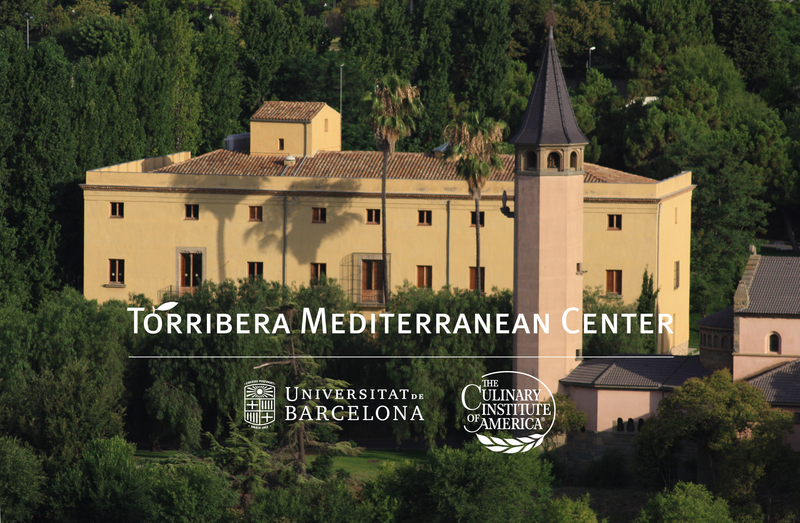 Hyde Park, NY – Today, the University of Barcelona (UB) and The Culinary Institute of America (CIA) announced the creation of the Torribera Mediterranean Center (TMC), a joint initiative and new academic center focused on Mediterranean food, health, and culinary innovation. The Barcelona-based partnership leverages the strengths of two leading educational institutions to address vital public health and sustainability issues through expanded academic, professional, and business collaboration. The Center will work to preserve and advance adoption of Mediterranean dietary patterns, focusing on connecting leading-edge food and nutrition research with culinary, agricultural, and business innovation. TMC is open to Mediterranean, European, and other international partners. The TMC is based at the Food and Nutrition Campus of the University of Barcelona at Santa Coloma de Gramenet. The Center offers two master’s degrees with a focus on the Mediterranean Diet—past, present, and future—and a proposed Mediterranean concentration program for CIA bachelor’s students. The academic programs at TMC are inspired by the traditional food cultures of the Mediterranean region and led by faculty from the UB and CIA, in collaboration with other universities and organizations around the world. The Center will also develop and conduct joint research projects combining nutrition and health, sustainability, food experience design, and food preference and food behavior change. Through its conferences, symposia, and digital media initiatives, the Center will host chefs, culinary scholars, public health leaders, journalists, policy makers, and other international experts to develop strategies to translate the existing scientific evidence for the health and sustainability of the Mediterranean Diet into action. The development of the Center and its programs will be guided by three stakeholder councils: leading scientists and technical experts from around the world (Scientific and Technical Advisory Council); chefs, food critics, regional cooks, food studies scholars, and other food and drink experts (Culinary and Foods Studies Council); and representatives of top Mediterranean institutions, companies, and producers in agriculture, food, beverage, public health, and other hospitality disciplines (Business Leadership and Innovation Council). For more information, or to register for the master’s degree program at the Torribera Mediterranean Center (TMC), please visit www.tmcmediterranean.org, e-mail tmc.ub.cia@ub.edu, or call +34 93 403 90 39. The University of Barcelona is the top public university in Catalonia in size of student population, around 64,000, and course offerings, with 73 bachelor degrees, more than 150 university master degrees and 48 doctoral programs. It holds the first position at a state level in scientific performance, with 45,796 published articles, according to 2016 data from the Spanish Foundation for Science and Technology (FECYT), which makes it the main research center in Spain and one of the most important ones in Europe, both for the amount of research projects—892 in 2015—and the obtained excellence in this field. The University of Barcelona is the leading higher education institution at a state level in the main international rankings. It is the only Spanish university to hold a position among the top 200 universities worldwide in the Academic Ranking of World Universities (ARWU)—more known as the Shanghai Ranking. The UB is also the top Spanish university in the QS World University Rankings 2016–2017 and listed among the top 200 universities worldwide. It also stands out in employability, as the second state university and listed among the top 70 universities worldwide according to the 2017 QS Graduate Employability Rankings. Regarding innovation, it holds the first position at a state level and among the top 100 according to the ranking Reuters Top 100: Europe’s Most Innovative Universities. A member of one of the most important excellence university networks at a global scale, such as the League of European Research Universities (LERU), the University of Barcelona has 301 consolidated research groups, and according a report by BiGGAR Economics, an impact of 1.400 million euros in Catalan gross value added (GVA)—which represents 0.72% of the total Catalan GVA—and a direct impact on 21,870 job positions (data from 2014). In 2016, Times Higher Education included the University of Barcelona among the world top 25 universities with more than 400 years of history. For more information, visit www.ub.edu. Widely recognized as the world’s premier culinary college, the CIA has an international reputation for excellence. The college has played a pivotal role in shaping the future of foodservice and hospitality education, and has had a significant impact on the growth and development of these industries. Founded in 1946, the CIA offers master’s, bachelor’s, and associate degrees with majors in culinary arts, baking & pastry arts, food business management, hospitality management, culinary science, and applied food studies. The college also offers executive education, certificate programs, and courses for professionals and enthusiasts. The CIA’s conferences, leadership initiatives, and consulting services have made the CIA a think tank of the food industry and its worldwide network of more than 50,000 alumni includes innovators in every sphere of the food world. Advancing public health has long been a focus of the CIA: Its Menus of Change initiative, a joint project with the Harvard University T.H. Chan School of Public Health—Department of Nutrition, is now a critical reference for foodservice sector strategy integrating optimal nutrition, environmental sustainability, culinary insight, and incubation of new business models. The Menus of Change University Research Collaborative, a joint initiative of the CIA and Stanford University—led by Stanford Prevention Research Center (Stanford Medical School) and Stanford Dining—further leverages this work in collaboration with 50 leading universities in the U.S., Asia, and Europe (including the University of Barcelona) through integrated, campus-centric research and education. A further partnership between the CIA and the University of California, Davis—The Healthy Flavors Research Initiative—focuses on innovation at the intersection of culinary insight, sensory science, and behavioral design. The CIA has U.S. campuses in New York, California, and Texas. The CIA Singapore offers the college’s renowned education in Asia. Faculty of Medicine and Health Science, University of Barcelona in collaboration with the faculty of The Culinary Institute of America. November 5, 2018–June 28, 2019. The learning objectives of this master’s program include: to deepen knowledge of the Mediterranean diet and food systems of the region as a model of healthy eating; to understand the impact of this diet on the prevention and the treatment of chronic diseases; to introduce health professionals to both traditional and innovative culinary practices of the Mediterranean; and to enrich understanding of the development of public health strategies to preserve and enhance the strength of these dietary patterns in society. Faculty of Pharmacy and Food Science, University of Barcelona in collaboration with the faculty of The Culinary Institute of America. January 9, 2019–June 28, 2019. The learning objectives of this master’s program include: to broaden knowledge of the historical and anthropological antecedents of Mediterranean food systems, the birth of the global, modern concept of the healthy Mediterranean diet, and the culinary cultures of the Mediterranean area as a sustainable dietary model; to understand the interplay between the Mediterranean diet and the evolution of culinary techniques, restaurant concepts and structures, food product development and retail, agricultural innovation, and communication patterns; and to explore patterns of globalization and adaptation of the Mediterranean model. Faculty of the School of Culinary Arts, The Culinary Institute of America in collaboration with the faculty of Pharmacy and Food Science, University of Barcelona. The proposed concentration (now in development) would run for 13 weeks in the fall and spring semesters. This immersive semester-away concentration, designed for bachelor’s students from The Culinary Institute of America, will provide an in-depth focus on the Mediterranean diet and the cuisines and cultures of the Mediterranean region. Through kitchen, classroom, and field work—together with regional travel—students will benefit from an unparalleled academic experience discovering the food cultures of Southern Europe, North Africa, and the Levant.